Alibaba unveiled the CIP program today as a key part of Alibaba’s new retail business. By leveraging the six procurement centers Alibaba has set up in Asia Pacific, Europe and North America, the program sources imported goods for all the online and offline outlets within the Alibaba ecosystem, including technology-driven grocery chain Freshippo (also known as “Hema” in Chinese), Tmall Supermarket and Intime Department Store. The program is a quick and low-risk way for international brands to enter China, allowing them to reach the nearly 700 million active users on Alibaba platforms. To support these newinitiatives, Alibaba’s smart logistics network, Cainiao, will continue to expand its network of bonded warehouses in China, with an aim to triple its total size to three million square meters in three years. 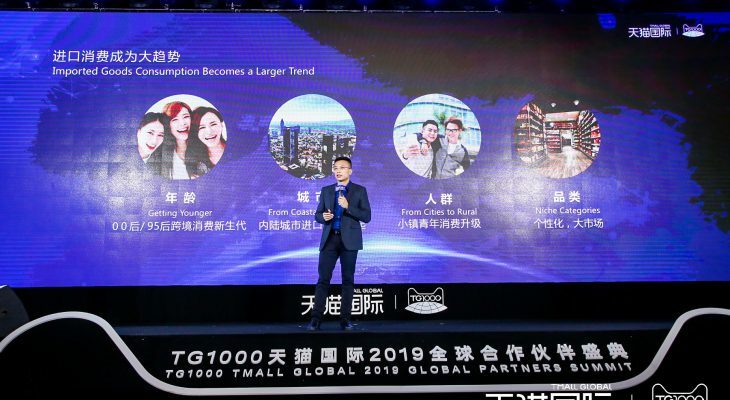 In Thailand, Tmall Global has empowered various brands to access and expand in the China market. Among them is Thai bottled bird’s nest drink provider Ninest, which opened its Tmall Global flagship store in May 2018. Sales during the initial three months were less than ideal. By using various marketing tools and campaign strategies suggested by Tmall Global, such as content distribution and testimonials by popular key opinion leaders, sales eventually improved. In September 2018, after it collaborated with a well-known Taobao broadcaster, it achieved RMB500,000 (about 2 million Thai baht) in sales within second. Subsequent collaborations showed even stronger results and the brand reported record sales of RMB900,000 (about 4 million Thai baht) during one of the livestreaming sessions. To date, Ninest’s monthly sales have increased roughly 10 times.